GenCon is traditionally a mecca for role playing (it was started by the D&D folks) and this year was no exception. I already mentioned a few kid-friendly titles yesterday, but the following include those targeted at a slightly older audience. For good measure, I’ve also included some of the (many) digital offerings available to help you run your choice of role playing games. First, the RPGs, then the digital utilities…. Some boardgamers may not always be aware of Fantasy Flight Game’s large role playing presence. 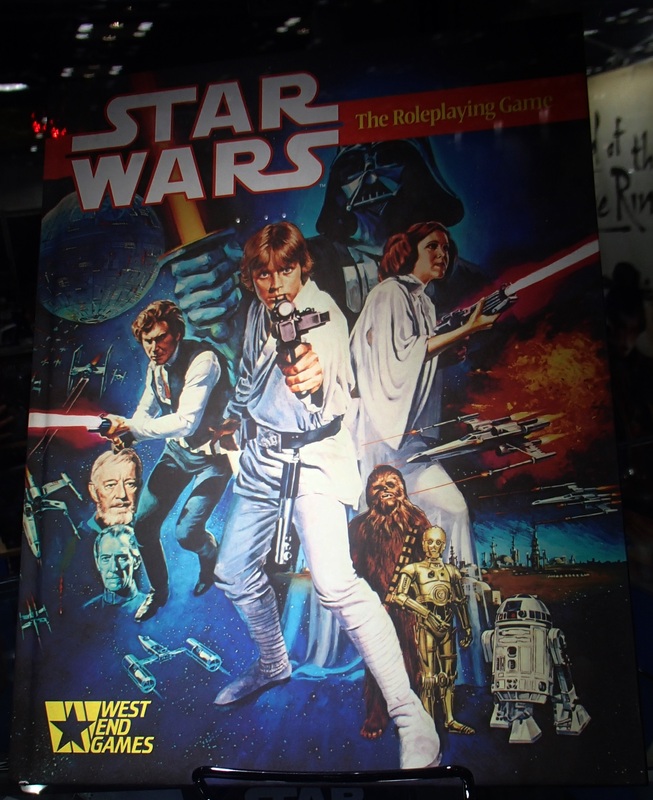 This year they were showcasing their take on retro-gaming with a rerelease of the classic Star Wars RPG first put out by West End Games in the late 80s. The RPG series is widely referenced as the inspiration for much of the later Star Wars canon. The new (re)printing contains two hardcover books in a nice slipcase, supposedly in higher resolution/quality than even the original books. FFG’s Runebound setting has been featured in several boardgames. Legacy of Dragonholt brings the setting to life using an RPG-esque ruleset labeled the Oracle system. 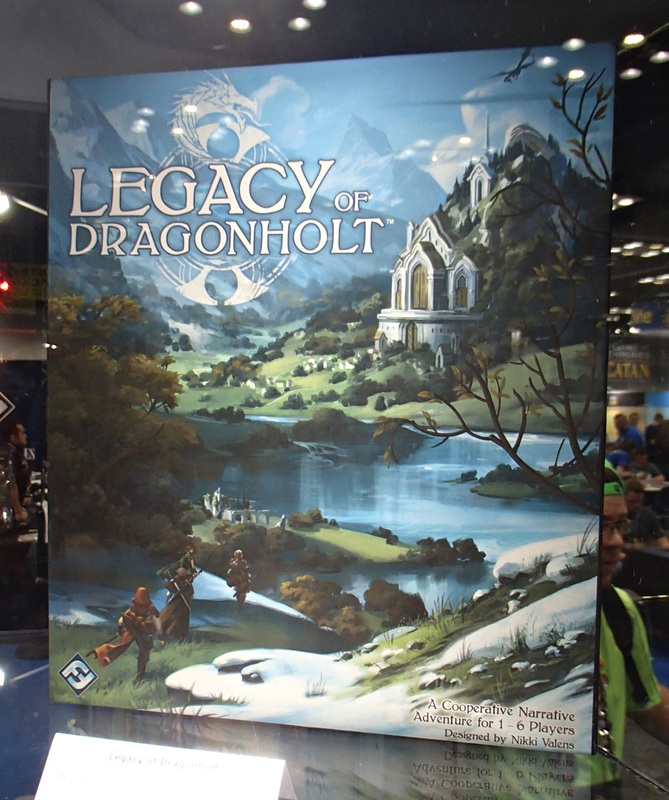 A cooperative game for up to six players, Dragonholt has allows players to customize their own character before heading out on one of six quests included in the game. Teased for a year now, the full fledged Sentinel Comics RPG is expected to come out at next year’s GenCon. However, in early 2018 we should have a quick start rules set complete with pregenerated characters and a beginning adventure module. The game system task resolution features a dice pool from three different sources. Players roll and are assigned a level of success rather than a pass/fail. Players can give the GM the option of “bad stuff later” in order to get more successes now. The system emphasizes narrative story telling, trying to capture more of that comic book feel. To that end, combat and non-combat resolution is all similar. Players are encouraged to “talk up” their actions, and can gain extra dice to roll if they can convincingly use their powers for the situation. I love me some superhero RPGs, so will be excited to see how things work next winter. Modiphius’ new Star Trek Adventures is (I believe) the fourth attempt at a Star Trek RPG. The new rules and setting make an attempt to focus in on a more personal setting. 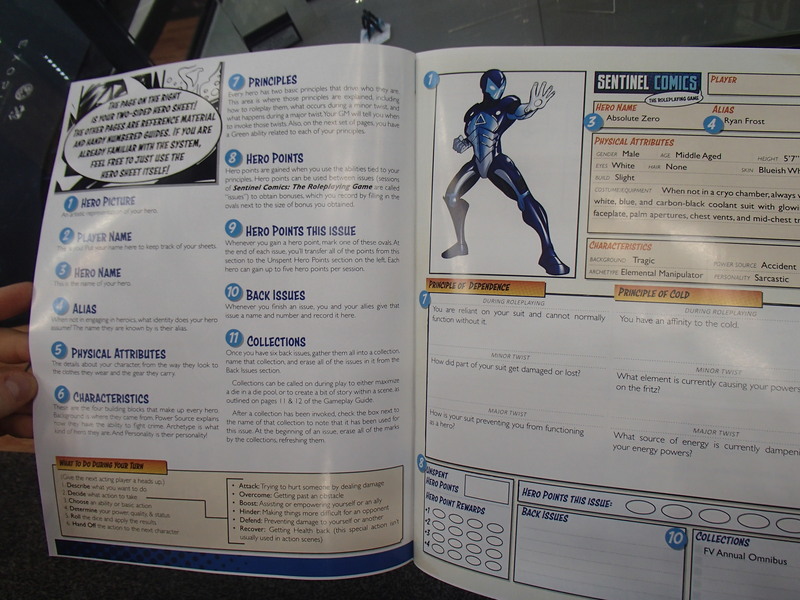 The rules include plenty of flavor text and descriptions directly told from the view of individual characters. Rather than lists of timelines of events, setting information is told from the view of the characters involved. 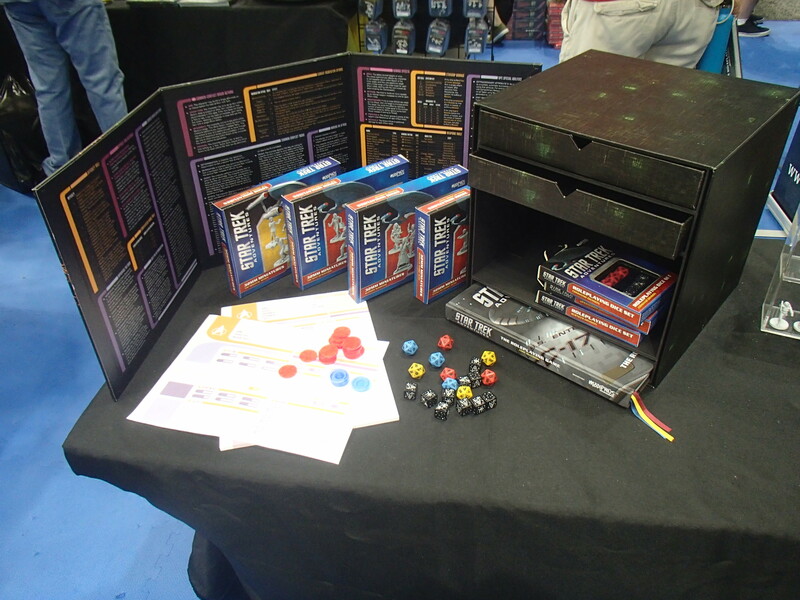 The game uses a 2d20 system where players roll both in hopes of getting low rolls on one or both dice, earning one or two successes. If a task is particularly difficult, players may need 3 or 4 successes which can only be pulled off by buying additional dice from the GM using threat, who can then use the threat for various bonuses, including powering up the big bad guys’ special abilities. To simulate away missions and keep everyone involved, players can have secondary characters to play while their main character is not around. These characters can also gain experience and could serve as a new primary character if a change is desired. The main rules should appear at retail in late September with the These are the Voyages adventure supplement appearing in early October. If you want the truly deluxe experience, the huge box ‘o goodness above comes in a limited edition (1701 copies – AKA Enterprise’s ship number) with holographic labels for a cool 395 British pounds. 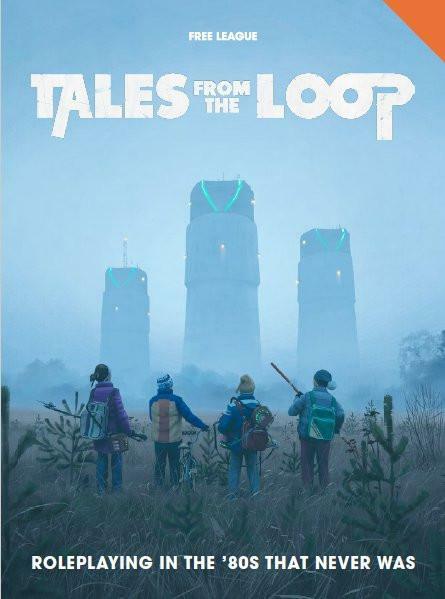 Tales from the Loop is an RPG homage to the 80s mixing up strange stuff with kids on bikes running around like ET and Stranger Things. Using a fairly lean and basic d6 system, players take on the role of a bunch of kids living in a small town above a secret particle accelerator. Weird happenings occur and robots and dinosaurs start to be spotted… Riding the success of Stranger Things, the Kickstarter was wildly successful and the first printing quickly sold out. It should be available again in October. 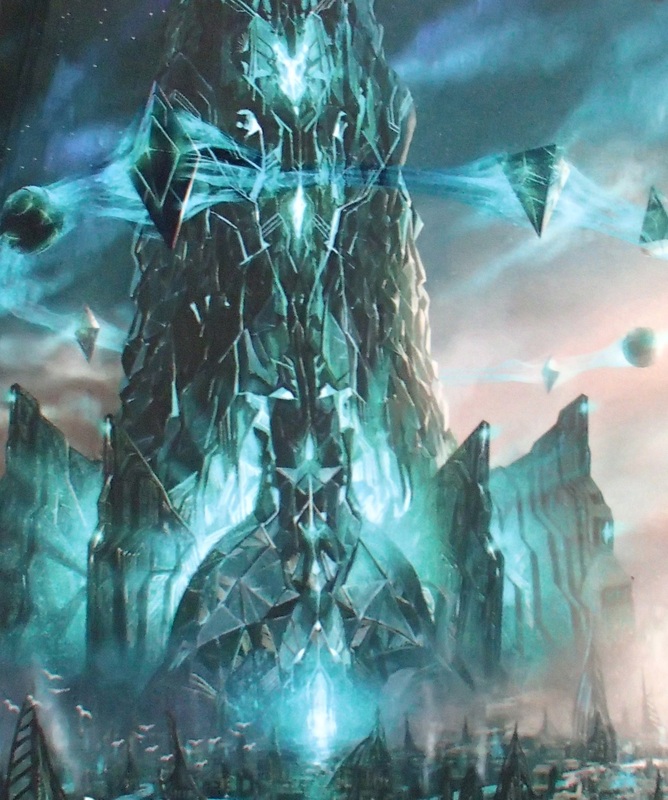 Monte Cook’s Numenera has won awards for its evocative setting full of long-dead techno-magic remnants and its streamlined story-based rules set. Jade Colossus is a GM’s companion serving as an adventure backdrop and a supplement. 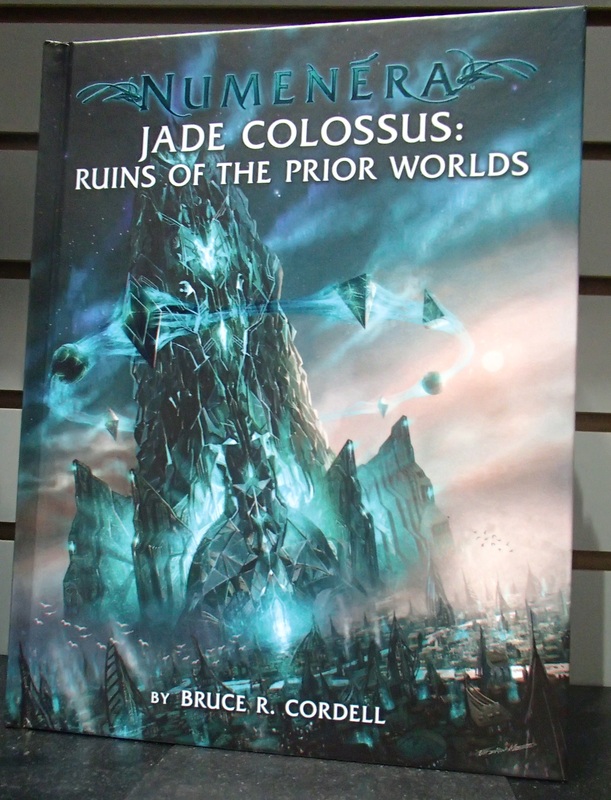 The Jade Colossus book offers up help and ideas on how to get up and running in the Numenara setting, descriptions and ideas for playing in and around the ancient Jade Colossus artifact, and a system of tables and charts to help GMs create new areas to explore. More than just piles of tables (for relics, encounters, fortune, rooms, etc…) the book’s Rune-Mapping Engine attempts to help GMs generate interesting areas to explore without ending up with a dungeon/building/ship full of completely unrelated rooms. Paizo always makes a splash at GenCon with their biggest new announcement. Last year they revealed they were working on a science fiction themed RPG based on the Pathfinder rules system. Starfinder released at GenCon, and as expected, it promptly sold out. 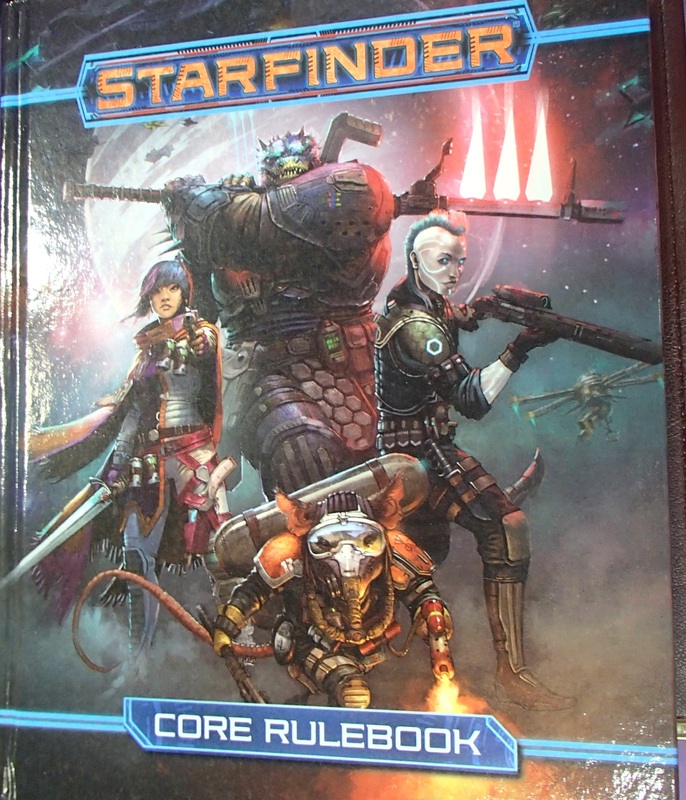 Players of the Pathfinder game (rules very similar to D&D 3.5) will be familiar with most of the Starfinder mechanics. Starfinder has six core classes including your basic fighting,healing, sneaking classes. Some standout classes include the mechanic (pet based class with drones), Solarian (attunes to weapons or armor and powers up as the battle goes on), and Technomancer (basically a wizard.) Note that there is no arcane vs divine magic, it is all the same. As always, human is an option but there are six other races to choose from. Because this is space-based, ship vs ship combat is included in the rules. Played out on a hex map it is a turn based affair that does allow players to use their characters as the action plays out. The ship combat can be a stand-alone rules set so could be played by itself as a strategic boardgame if desired. The setting occurs in the far future of Golarion (the Pathfinder world) so far as to leave plenty of gaps for Pathfinder players to fill in with their characters. The hub of action is Absalom Station, a large space station in the local solar system. 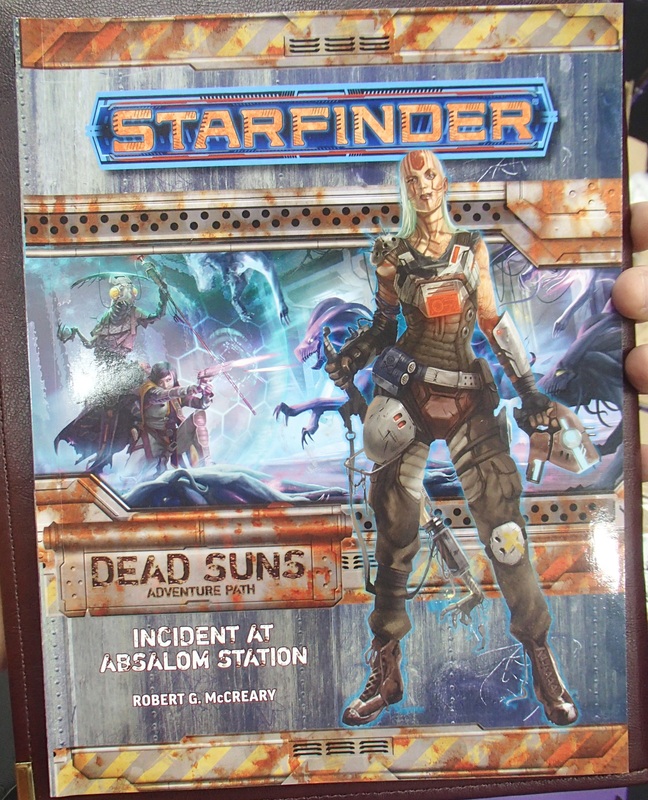 The first adventure path (called Dead Suns) chases the discovery of an ultimate weapon through several adventures, beginning on Absalom Station itself. In addition to the base book, there is the Alien Archive (monster manual) out in October, paper Pawn Collection, and a techy styled Flipmat. Wizards of the Coast had a very small presence at GenCon, focusing its efforts on the PAX conventions and a few smaller ones spread around the country. However, the upcoming releases have been well publicized. 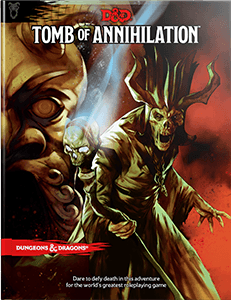 The big new campaign book is the Tomb of Annihilation, set to release September 19th. It details an adventure on the southern continent complete with a healthy dose of dinosaurs. A new DM screen will also be released at that time. On November 21st, Xanathar’s Guide to Everything will release, containing many new subclasses, spells and other goodies . Xanathar is an ancient Beholder in the setting and the book will include his commentary on many of the things inside its covers. In addition to the RPG releases, Betrayal at Baldur’s Gate is a D&D themed version of Betrayal at House on the Hill, complete with D&D themed stories as well as D&D themed player characters. Of final note is the continued roll out of D&D Beyond. I stumbled across the digital GM aid, InfinitasDM by Atom Switch, one early morning in the open gaming hall. 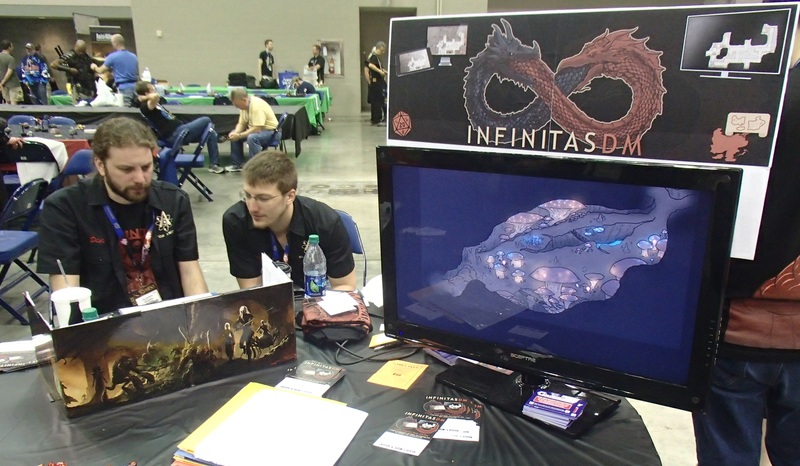 InfinitasDM is a kickstarter-funded computer program with a focus on helping GMs display maps to players and manage game information. GMs can write up background information, draw or import maps and then label locations (hidden or not) on the map and/or link maps to other game information. Sporting a robust fog of war option, the app can be used to project separate maps for the players and the GM (containing GM-only info.) Designed for local (in-the-room) play, the program doesn’t roll dice or resolve combat, instead focusing on providing a nice,simple mapping platform for face-to-face RPG gaming. 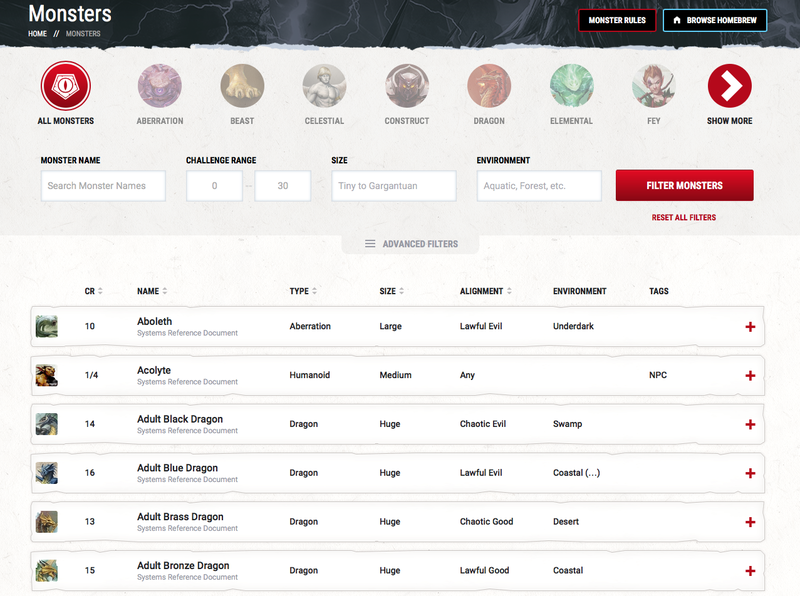 Roll20 is the newcomer on the block for online moderated role playing. It is free to participate, but subscribing to the service offers up additional benefits. The free version allows 100MB of online storage for maps, tokens, etc.. Upgrading to $5/month gives you 1GB of storage and the ability to import and export your characters around. $10/month grants 2GB of storage and unlocks piles of customization options (custom scripts, items, etc.. etc…) Part of the draw to the Roll20 platform (other than its free to play option) is the associated Roll20 marketplace. It is an online store for digital maps, tiles, tokens, and modules used for online gaming. In my opinion, Roll20’s current strength lies in the large, helpful community. Advice and assistance is fairly easy to obtain and the community developed assets (art, modules, etc…) are easy to bring into play. Buy a module, for example, and all the art (maps, tokens, characters) are there and set up to be easily used. There are many competing GM tools on the market, and more are appearing all the time. Some focus on integrated rules for internet play, others just on map displays. Hero Lab is primarily a tool for GMs to use at the table. Of all the user interface and menu systems out there, I have found Hero Lab to be consistently logical and helpful. They are currently moving over to a completely online system (yes, if you have no internet, you have none of the more powerful functions.) This will allow the program to store information in the cloud and can be run from more types of hardware than currently available. It will be subscription based with content purchases. Unfortunately, the new system will not automatically have access to any content already purchased for the previous Hero Lab version, but the expectation is that a relatively small fee will allow all old purchases to transfer over into the online system. The interface will start with the basics but then branch out to allow users to create their own custom content. Custom content should be much easier to implement than in the current Hero Lab (and I can attest that the current system is rather cryptic.) 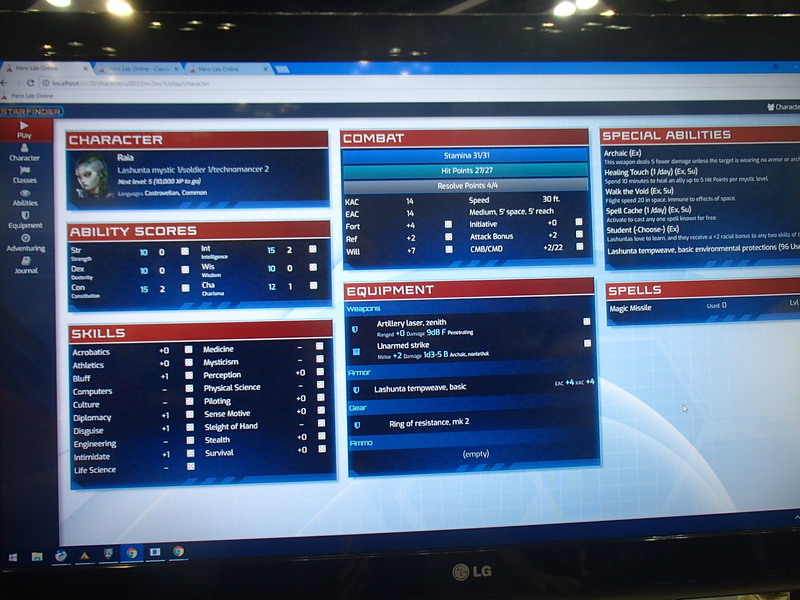 Hero Lab is gearing up for the new Starfinder system, as you can see in the thematic screens in the photo. That’s all for the RPG world (actually just a tiny slice of what was at the convention, but that’s all I have time to talk about.) Tomorrow we start in on the boardgames in earnest. 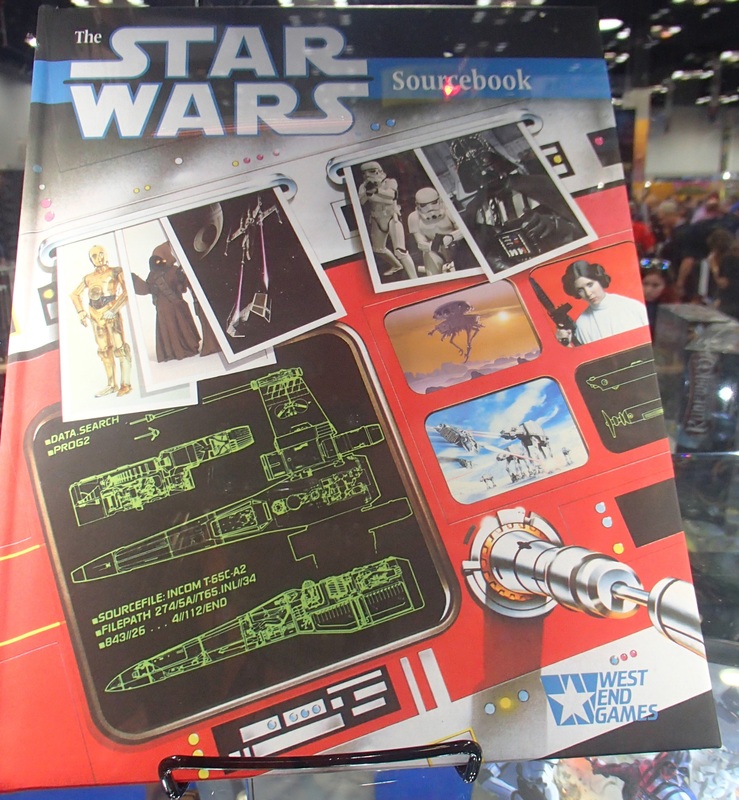 This entry was posted in Convention Report and tagged D&D, D&D Beyond, dragonhold, fantasy flight games, hero lab, pathfinder, roll20, rpg, star wars, starfinder, tools. Bookmark the permalink. Overall a very “blah” list of games…no wonder I am more into boardgames this year. Star Wars reprint? Nothing but fan service. The STA game in particular bothers me…I see a game with lotsa chrome items (minis, dice, etc) but not so sure of the “game” driving it all. Starfinder? I love sci-fi RPG play but never a fan of 3.5/3.75 etc. Tales From the Loop may be the only one I get…but as a child of the 80’s I worry that it just won’t “translate” to a younger generation. Saw the kids article (great job!) but my guys are a bit older than that group. I was part of the playtest for STA. It just couldn’t keep my interest. Seeing the “deluxe” set all I frankly see is a ca$h grab by Modiphius…but fan service can be a very lucrative ‘enterprise’.